I went to yoga this week for the first time in a while. It felt odd walking into the studio again, as if I were vibrating on a different frequency than I used to do. As I unrolled my mat near the back corner and settled into child's pose, I felt more independent than usual, a bit divorced from the class format and the idea of following a teacher. I reflected that it might have to with the fact that I've been spending so much time working and writing about my witchy spirituality. I guess it's recalibrated me a bit. Wicca is about individual spontaneity and freedom, following your inner self, doing "as you will." But on the other hand, I do love it when my witch-path intersects with and is enriched by other approaches. The class turned out to be great. Our teacher tied the class in with the nine-day Hindu festival of Navrati which is happening now -- a festival in honor of Durga, one of my very favorite Goddesses. Durga is very ancient and overarchingly powerful goddess with numerous aspects and manifestations. The first three days are devoted to her aspect as Kali, goddess of death and life, the middle three days to Lakshmi, goddess of prosperity, and the last three to Sarasvati, goddess of wisdom and art. The presence of these three goddesses infused the class with wonderful energy for me. As I went through the poses I did notice that I felt freer to do things in my own witchy way as opposed to the way I thought I was supposed to do them. Yoga teachers often tell us to make the poses our own, and this time I took that freedom to heart. 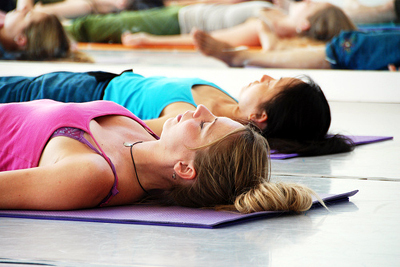 This delightful confidence became especially clear to me during the last pose, the deep relaxation known as shavasana. As has happened to me so often during shavasana, while I knew I was supposed to be lying there absorbing the present moment in serene bliss, my mind was actually jumping all over the place, from emails unsent to poetry to health concerns to spiritual thoughts to housework undone to plans for future decades, while my body felt stiff as a board. Alas, I have never found another teacher anything like my Bikram yoga teacher in San Francisco in 1990, who calmly shared with the class during each shavasana a fullbody guided relaxation that melted my entire being into the present moment each time without fail by the time he stopped speaking. And then it hit me: monkey mind was acting out, just like an unruly toddler. Now, I have successfully mothered two toddlers into awesomely wonderful people. And I did not achieve this by "noticing" their antics and moving on whenever they acted out. If I had done that, they would have just escalated their antics -- exactly as monkey mind was doing! Long ago, I realized that a toddler who's acting out is feeling unloved, and the only thing that will calm them down is: love. The thought came to me: if monkey mind were my kid, they would need a hug right now. So, I did it. I violated everything I had been taught about not holding onto any thought and held onto monkey mind -- hard. I felt myself flood with love for monkey mind, love for its curiosity and energy and how it always looks out for what might be good or bad for me. I said, "I love monkey mind!" to myself and, just as if it were a kid needing attention, I gave it a nice big mental hug. And guess what happened next? Pure bliss. Within seconds, all was quiet, and monkey mind was nowhere to be seen.